It's easy peazy... Just follow the steps below. 1. Click "Apply Online" button on the far right to register your child. 2. Scroll down to select the city and date you are registering for. Pay through PayPal. Either the full camp fee or a deposit. (See the refund policy below) You are not registered until you do BOTH! That's it! Welcome to the KIDS FIRST! Team! Here's your chance to get started. Sign up for Day 1, Day 2 or Both! For more information, click through on links below. To reserve a spot for your child, you must fill out the online application and pay either the deposit or the full amount. Full payment is due no less then 30 days prior to the start date of camp. See below for refund policy. Support a youth at camp! Donate to KIDS FIRST! Film Critics Boot Camp Scholarship Fund! Note: Camps have a limited enrollment and are filled on a first come/first served basis. This camp does not in any way guarantee the participant employment in the entertainment industry. All camps are subject to cancellation if inadequate registration is not received or other unexpected circumstances make it impossible to take place. All camps have limited enrollment and are filled on a first-come, first-served basis. KIDS FIRST! 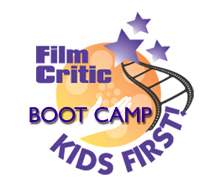 Film Critics Boot Camp is a project of the Coalition for Quality Children's Media, a national, 26-year-old, nonprofit (501-c-3) organization whose mission is to teach children to become critical media users. *Refund policy on deposit: 100 refundable up to 90 days prior to event; 50% refundable up to 60 days prior to event. Less than 60 days - Non-refundable. There are no refunds after 60 days. Please be sure to check any scheduling conflicts before registering your child. ** Balance Due: 30 days prior to event.